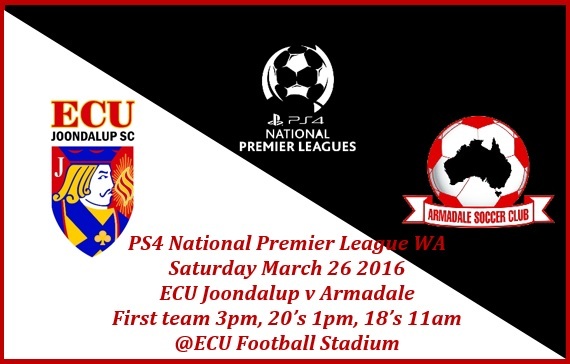 ECU Joondalup play their first PS4 National Premier League WA home game of the season on Saturday when they entertain Armadale at the ECU Football Stadium (3pm). Both sides will be looking to kick start their seasons after losses in the opening round, the Jacks were beaten in the local derby at Sorrento, while Armadale were beaten 4-1 at home by Perth SC. Gordon Smith will make his ECU debut on Saturday, the former Dumbarton and Hearts striker missed the loss at Sorrento due to suspension, and is looking forward to get started. “I was very disappointed to miss last week and wasn’t aware that the bookings carried on to the league games otherwise I wouldn’t have played the last game of the night series on a booking,” he explained. Armadale beat ECU in the Night series and Smith said they were good that night, but he believes Joondalup are gelling well, and hope to start their home games with a win. Coach Dale McCulloch is looking for an improvement on Saturday against a good Armadale side. “We were beaten by Armadale in the Night Series, and they played well that night, but we will be looking to reverse that on Saturday,” he said. Get along and Support the Jacks!!!! !